Welcome to a new series about working with the Embark framework. We’ll assume you have a basic grasp on programming and that you’ve read some of our basic explainers or tutorials, in particular the intro to Ethereum or even the Raffle-building tutorial for Ethereum. Embark is a set of tools for developing decentralized apps on the Ethereum blockchain. It’s an alternative to Truffle and comes with a variety of addons like out-of-the-box integration with IPFS and ENS, a ReactJS-based web app template, and more. 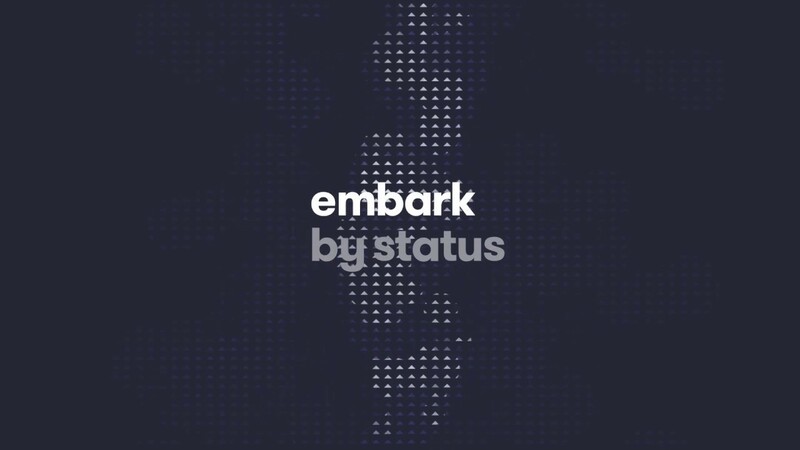 Embark popped into existence some 3 years ago and was relatively recently acquired by Status who are now funding its development and growing its ecosystem. This tutorial will show you how to get started with a simple smart contract for a custom token on Embark. For the purpose of this tutorial, we’ll assume you’re running a *nix based operating system like OS X or a flavor of Linux. If you aren’t, we recommend downloading Git Tools which include Git Bash and thus emulate a Linux terminal rather well. Another approach is downloading and running a simple and effective virtual machine like Homestead Improved. Note: there’s no official NVM for Windows – alternatives are nvm-windows and nodist. Instructions for installing IPFS are here. Instructions for installing Geth are here. After having installed all the necessary tools, check if they’re functioning by printing their versions. All versions should be equal to or newer than the ones in the screen below. After that, we run the initialization command in the folder where our project will be residing. Finally, by running embark run we’ll launch the Embark Dashboard. What this means is that the standard environment for running our dapp (decentralized app) and its smart contracts needs to be on the localhost server (our computer), on the 8545 port (which matches the Ethereum Geth node that Embark is running). dappConnection will determine how the web app should connect to the blockchain during its run. It prefers Web3 first and foremost – this is offered by MetaMask or an app like Status, and if the Web3 connection is unavailable (MetaMask isn’t installed or the app doesn’t provide Web3), it’ll go for a direct approach – first through websockets and if that fails through regular old HTTP. This section usually doesn’t need to be changed. gas tells our environment how much gas to spend on deployments. In a local development environment, this is fine on auto, letting Embark decide. Embark will now monitor the changes in our files and rebuild and recompile them as needed. In this case, Embark reports an error because the file we need doesn’t exist. Other configuration options can be seen in the official docs. Let’s build the token now. … you’ll notice that dashboard reacted to this and rebuilt our app, outputting the address on which the smart contract was deployed. So we don’t develop a token from scratch, we’ll use existing templates from way better programmers. We’ll use OpenZeppelin’s library which we’ll then extend for our own purposes. Immediately after saving the file, Embark Dashboard will report a change and rebuild the files, sending the imported contracts to the blockchain. The ERC20.sol contract we’re importing has its own imports: SafeMath and IERC20.sol of which the latter is just and interface – a description of which functions should exist in a smart contract, so it’s not deployed. 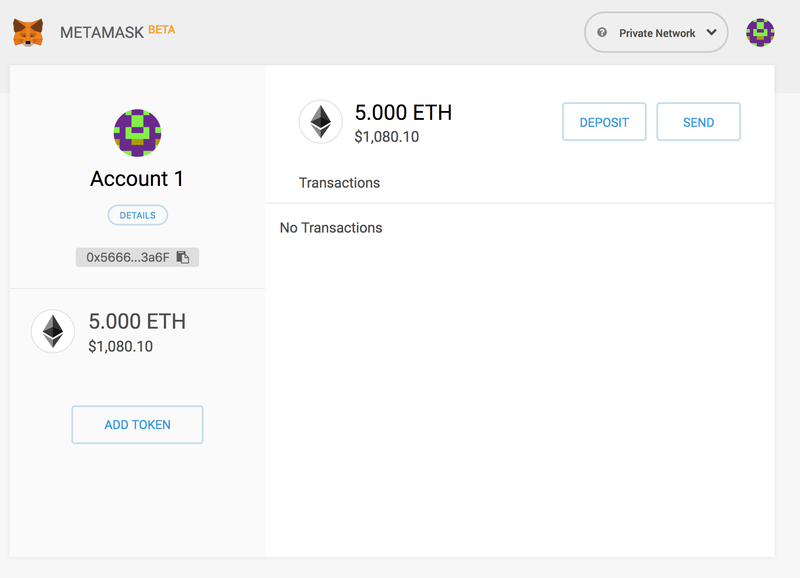 Example: the IERC20 interface defines that an ERC20 token must have a transfer function. If it does not, then it’s not a real ERC20 token. This helps exchanges and wallets easily implement new ERC20 tokens because they know which functions a token will have by default, allowing for only a minor code change to add a new token. is X means “inherits all functions from X, and can have other functions”. After saving changes, Embark will rebuild the project automatically. The contracts which are already deployed will not be re-deployed unless changed. We now have a solid foundation for our token. Let’s personalize it by adding a symbol, name and number of decimals. After deployment, our token will be called “Bitfalls Token”, it’ll have the symbol “MEH”, and will have 18 decimals much like ether. But this is useless to us – the token isn’t sent to anyone, but remains in the ether, just idling there. Let’s upgrade its constructor. A constructor is a function which is automatically run only once for each contract during deployment and is usually used for initializing some state variables, settings, ownerships and permissions, ICO durations, etc. In this case we’re using it to call _mint which is an internal function present in the parent contract ERC20 and which lets us create a certain numbers of tokens in the balance of a specific user. Here, we’re adding all 100 million of our Bitfalls tokens to the sender of the message or, in other words, the address of the person who deployed this contract. But… which address is that? Who is deploying it? When running embark run, the private version of geth being run behind the scenes is the private node onto which our contracts are going to be deployed. That node has its own Ethereum accounts from which it’s running commands, so msg.sender from the above code matches a random address generated by Geth. We don’t have access to that address, so the fact that we sent our tokens to that address isn’t very helpful. Actually, our tokens are useless because there’s no way to access them through “someone else’s” account. We can get help from the onDeploy hook here. During a deployment process, Embark will fire off some trigger, or hooks. One is onDeploy which happens after every single deployed contract, and one is afterDeploy which happens after all contracts have been deployed. onDeploy is defined in the config/contracts.js file as an attribute of the contract we’re deploying. Let’s define it for BitfallsToken in such a way that all the tokens are sent to an address which is under our control. 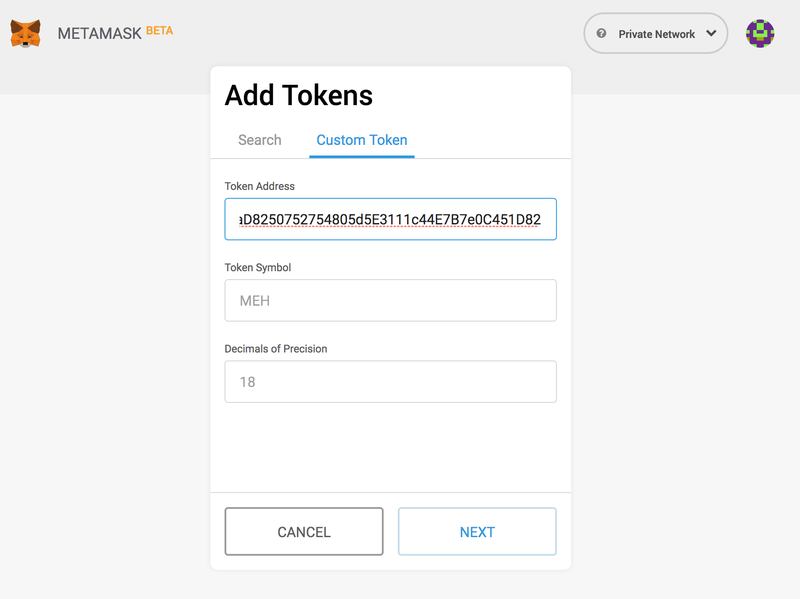 You can get one easily with MetaMask. In my case, it’s 0x5666c33bb922F97B6721D3f932dfD9350C933a6F. This literally means “During deployment of the Bitfalls Token, pick the method transfer and use it to send the address 0x566... 100 million tokens with 18 decimals”. Another problem remains: our address 0x5666c33bb922F97B6721D3f932dfD9350C933a6F doesn’t have any ether on this private blockchain, so it can’t use the token contract. In other words, it can’t send the tokens around. 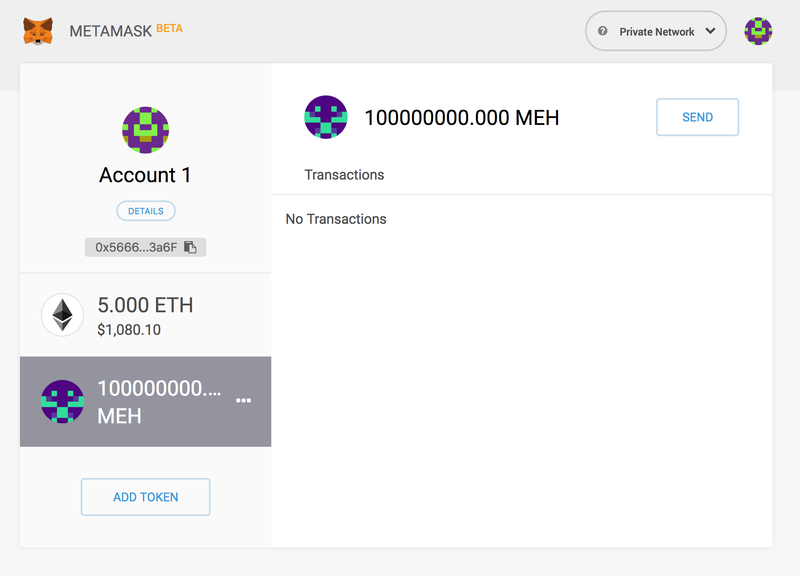 While we’re in local development mode, we can define the starting ether balance for accounts for which we have the private keys. We can easily get a private key from a MetaMask address by going to Details and then Export Private Key. Note: take care not to share a private key you actually use on a wallet in regular life. Remember – the private key on a testnet or a local blockchain also unlocks the account on a mainnet! After we’ve got the private key, the file config/contracts.js can be used to define how much ether we want on it. Finally, let’s re-run embark run (you can kill it with CTRL+C). If we check the account balance now, we’ll see 5 ether. Let’s add the “Bitfalls Token” by going to Add Token and entering our token’s address. The address is visible in the dashboard but also in chains.js. 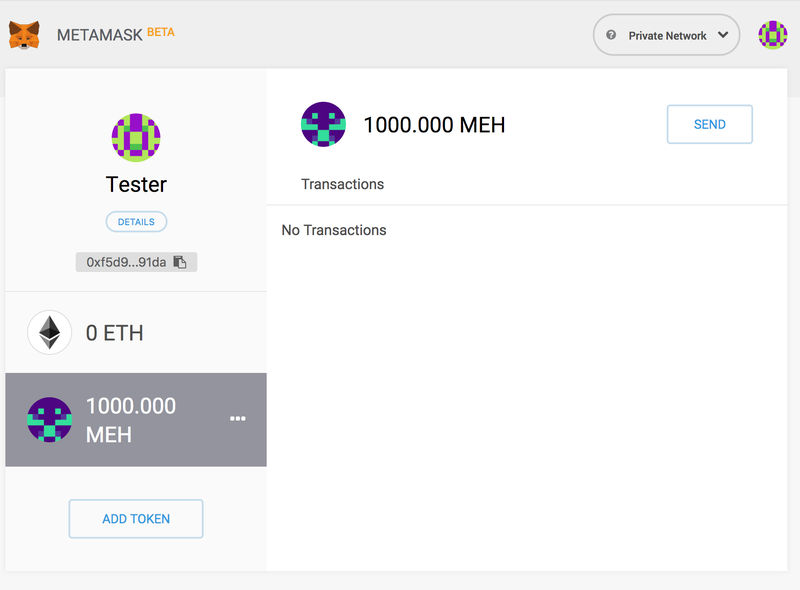 After adding, our balance will be 5 ether and 100 million Bitfalls MEH tokens. If we try to send tokens to another address, everything should work as expected. As you can see, developing a token with Embark is very straightforward. The process of development is similar to those in other environments like Truffle, with the added advantage of Embark Dashboard and other helper tools which let us focus on development instead of tweaking the system. In the next tutorial we’ll deal with adding custom functions into the token and a truly crucial part of smart contract development: testing. Previous articleFintech Friday #7 – Coinbase Commerce Added! Bruno has a Master's Degree in English Language and Literature and Computer Science, and has been in web development and publishing for over a decade. He's been in the blockchain space since 2015. He's an avid board gamer and VR enthusiast - find him on Oculus and Steam as TheSwader. He frequently rants on Twitter.